...I've just had really b-o-r-i-n-g projects. You know the type: mending, altering, etc. Not interesting enough to blog about. Most boring among the long list of forgettable projects: outdoor curtains. My husband has wanted some for several years, and demanded hinted that I should put them on my docket for this summer. Unfortunately, summer will probably be over before I finish them. All white fabric and so many straight seams! I've only completed one (I think the plan is for 6 or 8), but I need a break -- something fun! Dresses are normally not my thing, but we have an event later this month for which I really should wear a dress. So, I'm making one: Vogue 8766, view E. It is well reviewed on Pattern Review and billed as "easy". This particular event has a color theme every year -- 2013 is the year of Tangerine -- so while awaiting the arrival of my tangerine dye from Dharma Trading, I started fitting a muslin. My shoulders have recently become narrower in proportion to my waist. 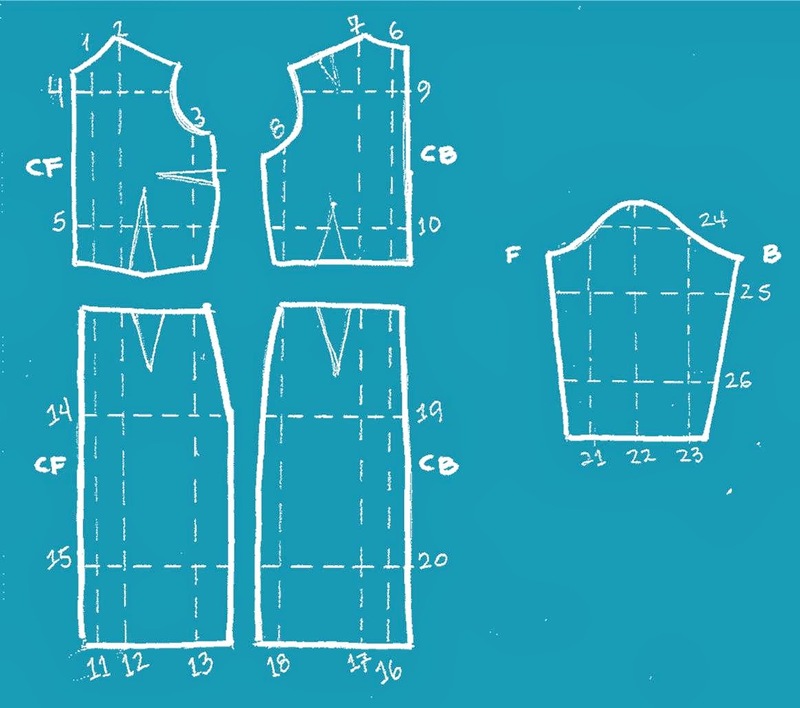 My usual method for handling my disproportionately large waistline is to get a pattern that fits me in the waist, and reduce the shoulder width. That hasn't always given me the best results, and I understand that I should do the opposite -- buy a size to fit my shoulders, and expand everything else. It sounded so simple. Threads #101 has an interesting article about grading patterns, which was helpful for me to figure out where to slash and spread the tissue. It involved a little bit of math -- which always makes the project more fun, and gives me the peace of mind that I'm using a scientific process. 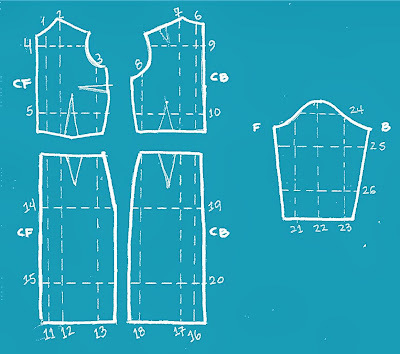 In a nutshell, you figure out the difference between the pattern measurement and the body measurement, which is the "overall grade." Divide that by 4 to get the "allocated grade" (AG, allocated between four pieces). The allocated grade is then further allocated between three lines (hash marks, below) per body quadrant. For the body measurement, I allowed for ease, by assuming the same ease built into the pattern (so if drawn for a 25" waist, and the finished waist measurement is 27", waist ease = 2", so I added 2" to my waist measurement). The Threads methodology drawn on my pattern. In this particular project, I needed an extra SIX inches in the waist (hard to believe that I've lost a couple inches there in recent weeks), so that six inches in overall grade became 1.5 inches in AG, divided into 3/8" or 3/4" spreads at the waistline, detailed in the table above. The bust (apex) and hip lines required only about 1/2" additional, which worked out fine for a wedge slashed into the pattern: wide at the waist and tapered toward the top and bottom edges. After all the wedges were in place so that the tissue was flat, I re-drew the grain lines and blended any other lines. Muslin #1 neglected to take into account the additional required for bodice length (duh), so it was a bit too short in the front (not as much in the back due to my sway back). Unfortunately, I ignored this great tool from Threads and I only increased bodice length along lines #5 (front) and #10 (back) where the patterns had markings for "lengthen/shorten here." It would have really been better to use line #4 also -- at least in the front -- because I ended up lowering the bust darts and armscye, anyway. By the way, the Threads table didn't seem to allocate enough in the vertical direction to meet the overall grade -- my table is adjusted to reflect the increase. In the process of fitting, my husband learned how to pin out excess fabric for me! He did well on his portion -- the back looks pretty smooth. I'm still not all that happy with how the bodice fits me along the side seams, but I'm saving that for later, since it should be an easy fix that I can pin out myself. The skirt seems perfect, though. I'm still not sold on the new process -- I do feel like I'm making many more changes than I would have using my old method. However, if it results in a better end product, it's worth the trouble. After working on this over the weekend, I realized that Linda Maynard teaches a Craftsy class on fitting that uses this exact pattern. Seems like that may have made it easier for me. So, how do those of you experienced in the art of fitting usually buy your patterns and fit them? Am I the only one who has been doing it wrong? !